No amount of fresh paint can cover up The Legend Of Zelda: Twilight Princess’ flaws. Playing Nintendo’s new gussied-up version of the game bears out the same problems fans and critics have been complaining about for the last 10 years: Twilight Princess is a bloated and sluggish adventure that houses some of the series’ best, most diverse level designs but often devotes the hours between them to the dullest chores imaginable. It hits its stride after an excruciatingly slow 12-hour first act, but that propensity for stalling persists, infecting everything from the most effective tactic in many battles—wait for all the monsters to bunch up and kill them all at once—to the absurd amount of time you need to waste waiting for the sun to rise and shops to open. Beyond the clever dungeons and toxic lethargy, Twilight Princess has subtle flecks of unfulfilled potential. It approaches some of the series’ foundational elements—combat, scope, world building—in more sophisticated ways, expanding on them with ideas that would become trendy in the years to come thanks to games that carried the torch of its primordial ancestors. It never fully commits to any of its renovations, instead meekly falling back on the template set by Ocarina Of Time. This re-release only serves as a reminder of how tired and outdated that template is, and by doing so, puts even more pressure on Nintendo’s mysterious upcoming Zelda game to reinvent the series. Luckily, Twilight Princess’ half-measures provide a few intriguing directions for that reconstruction. One of the most striking revelations Twilight Princess HD holds is just how ambitious the game got with the series’ sword fighting. Throughout Link’s adventure, he learns new moves to use against the game’s increasingly complex enemies. By the halfway mark, he’s a more formidable swordsman than ever, capable of stunning opponents with his shield, slashing as he flips over their heads, or popping out of a sideways roll sword-first to strike at their unprotected backside. These Hidden Skills, as they’re called, provide a valuable layer of strategy and combat options. Instead of just back-flipping out of an enemy’s range and waiting to retaliate with a jump attack (or pressing a button when you’re told to, à la Wind Waker), you’re given the chance to figure out which techniques would be the most effective and how to best time their use against a defensive opponent. This Link is, potentially, more of a cunning hero than the slash-happy bumpkin he’s been in other legends. But Twilight Princess squanders that potential at every turn. Since these skills are entirely optional and can be easily missed across the game’s dozens of hours, they don’t factor in to many fights. You can mostly get away with just running around swinging your sword willy nilly. It’s not until you’re going up against heavily armored lizard-people and demonic knights that their utility becomes apparent, and you can probably count those instances on two hands. Those rare limit-testing fights are the game’s most exciting, though. They force you to stick and move and choose every action carefully. That kind of tension and capacity for strategy is nowhere to be found in other Zelda games, and it’s made even stronger if you play in Twilight Princess HD’s additional “Hero Mode,” where enemies do double damage and healing items are few and far between. Even then, though, you’re forced to search out these additional skills, which means they serve less as a palette for the player to master over time and more as an artificial way of making the game easier as it goes along. Considering the kind of encounters you find in Twilight Princess’s final hours, one can easily imagine a modern Zelda game that gives you all this ferocious flexibility upfront and tunes its duels around continuously forcing players to reexamine their options and experiment with all their available tools in new ways. Twilight Princess’ opening hours are infamously dull, but at least they’re full of well-intentioned tedium. This legend’s Link is a farmhand, and we’re thrown into his everyday life just as he’s about to embark on his first trip outside his tiny village. The gauntlet of chores and friendly conversations serve two purposes: teaching the game’s basics and, more importantly, impressing upon us just how small and quiet Link’s life is so that when he escapes the confines of his village for the open landscapes of Hyrule Field, the sense of freedom and adventure will be even grander. But by the time you actually get there, the game has already gorged on mysteries and lore and mindless fetch quests. Emerging into the fresh air of Hyrule Field isn’t so much a moment of awe as it is one of relief. In truth, there’s little to be in awe of anyway. Twilight Princess’ world is an ugly expanse of strange topography fractured by inexplicable bottomless pits. It is large, but due to the technical limitations of the time, its various regions are compartmentalized as opposed to blended together into a single impressive landscape. The one claim Nintendo has made about the new Zelda is that it’s going to be an attempt at building that exact kind of seamless, picturesque world. In that context, the patented, oft-reviled Zelda slow open makes more sense—provided it avoids Twilight Princess’ scattershot ramblings. What Twilight Princess did get right about Hyrule is establishing a sense of history and culture. The Zoras and Gorons are treated as proud communities with their own traditions and beliefs. Several of the dungeons—a mining facility, an ancient prison, a mountaintop mansion—are real places with purpose beyond just being trap-filled mazes, giving reason to the nature of their puzzles and adding to the illusion of the game being a functioning world. Its cast even features a scholar who’s devoted to studying Hyrule’s mythology and the artifacts that have been strewn around the land. 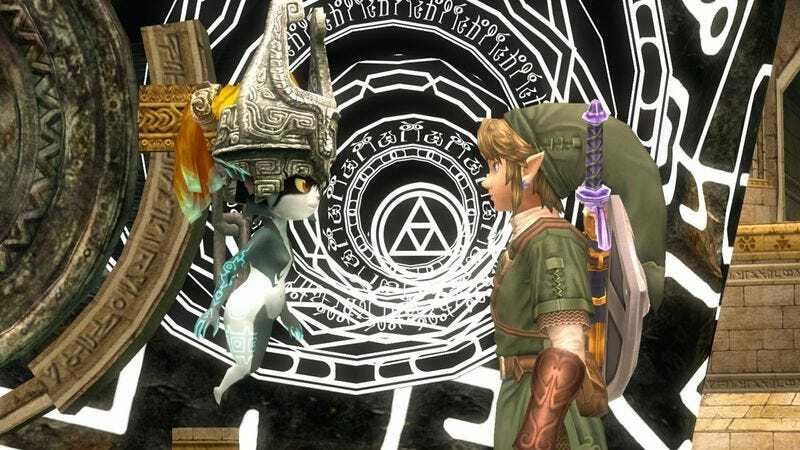 As is typical for Zelda, though, mythology and reality are one and the same in Twilight Princess, and the game subtly explores that intersection. In the first scene, Link’s mentor explains a myth behind the twilight hour and what makes it a time of sadness. We eventually learn that his parable is truer than anyone could have imagined: It’s a poetic explanation of the existence and plight of The Twilight Realm, a dark alternate dimension that merges into and attempts to conquer Hyrule. Of course, Link’s eternal adversary, Ganondorf, turns out to be the one pulling the strings behind that invasion. He poses as a god and takes advantage of a depressed, power-hungry Twilight-dweller’s faith, manipulating him into launching this evil plot. In the most bizarre twist of all, Link’s journey takes him to a city in the sky, the home of the nightmarish chicken-human hybrids who’ve continually popped up in his journey and are, in actuality, members of a legendary race of beings whose myths your archaeologist friend has been studying for years. It just so happens that the game has secretly been building up your connection to these unassuming creatures and their culture the whole time. While Twilight Princess often goes overboard with exposition, it gets an impressive amount of mileage out of understated and environmental storytelling, which would be right at home in the more open-ended experience Nintendo has said its upcoming Zelda will be. Despite some forward-thinking wrinkles, Twilight Princess remains a victim of horrific pacing and formula. Even in 2006, its slavish adherence to the series’ structure was an early catalyst for all the criticisms against Zelda’s stagnation, a plea Nintendo has promised to address for multiple games but only began satiating with the modestly radical A Link Between Worlds. Ironically enough, whatever the next Zelda turns out to be, if its creators are seeking some inspiration—whether its new ideas to pursue or pitfalls to avoid—there is some left to be found in Twilight Princess, the game that broke Ocarina Of Time’s back.